Electro-Static Advantage – Electro-Static Refinishers, Inc. Concrete staining has a proven record for strength, durability, and cost effectiveness for a variety of applications including interior floors, walkways, patios, garage floors,driveways, and commercial floors. 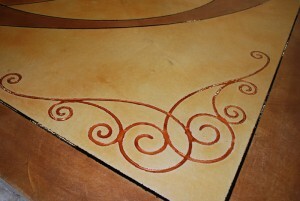 Concrete staining adds a great artistic aspect to any surface it is applied. No concrete slab is the same and this adds to the artistic beauty of concrete stained floors. 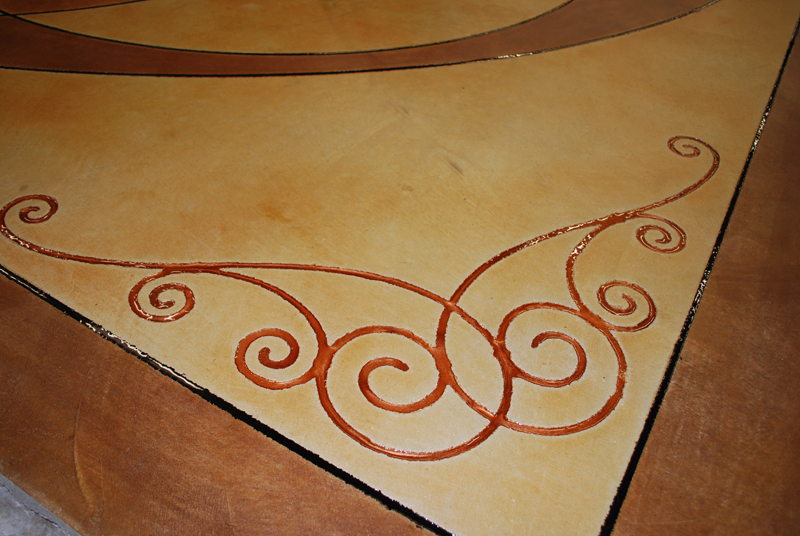 Our concrete artists are specially trained to give your surface a beautiful decorative concrete finish. Decorative finishes can be applied to existing or new slabs. The finish can last the lifetime of the concrete, and are durable, sanitary, and easy to maintain. A wide range of effects are possible. The stain can be added to accent features around it. Stain can be added to concrete walkways to match architectural features or blend into the landscape. If the look of natural rock materials are preferred, custom engravings can be added to the concrete to achieve the look of flagstone, river rock, slate, brick, and many other designs! A stained and scored surface can imitate tile, or present a colorful palette of abstract intersecting shapes and designs. We can transform your plain concrete surface into a unique work of art! Strength and Durability – We use high quality stains and sealers that will last for years! Green – We use products that are environmentally friendly. Cost Effective – We can create elaborate designs that are very cost effective with out concrete staining and engraving process. Allergy Friendly – For those who have problems with allergies, concrete stained floors is a great alternative to other floors! Remove allergen filled carpets from your house and add an artistic flair to your concrete surface! Maintenance – Concrete Stained floors require little maintenance. The occasional sweeping and mopping is all that is needed in order to clean your floors. Depending on the amount of traffic on an interior surface a coat of wax will need to mopped on to the floor 2-3 times a year for residential, 6-8 times a year for commercial. This maintenance layer of wax is easily applied and dries within an hour of the application. Keywords: Concrete Stain, Coppell, Arlington, Mansfield, Dallas, Ft. Worth, Cedar Hill, Midlothian, Waxahachie, Duncanville, Red Oak, Plano, Highland Park, Richardson, Allen, McKinney, Desoto, Grapevine, Ellis County, Dallas County, North Dallas, Rockwall, Mesquite, Garland, Flowermound, Rowlette, Grandprarie.